Here is a piano solo record from England performed in a style that I really enjoy. I have not been able to find much information about British pianist Gertrude Meller – she seems to be all but forgotten today. I was able to find some online references to her performing around 1907 and also of her performing on radio over the BBC in the early 1920s. There is a YouTube video featuring one of her other records which states in its description that she was a pupil of Francesco Berger. But that video is the only source I could find for that piece of information. 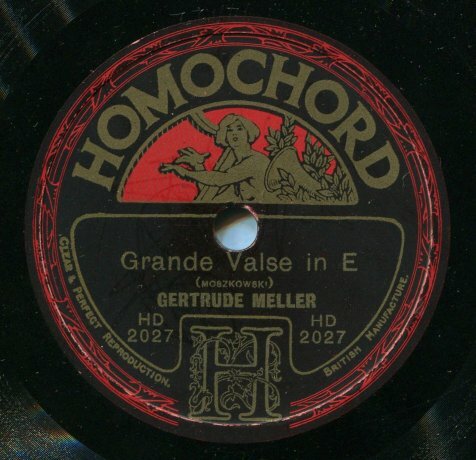 She did make quite a few recordings for the British Homochord label – a 1925 Homochord catalog that I found in an online archive lists a total of 30 sides. “Paraphrase de Concert” is Franz Liszt’s 1859 piano reduction of “Bella figlia dell’amore” from Act 3 of Giuseppe Verdi’s 1851 opera Rigoletto. “Grande Valse In E” is the waltz from German-Jewish composer Moritz Moszkowski’s 1884 “Trois Morceaux” (Opus 34 No 1). The Homochord label and its parent company, British Homophone, was the British affiliate of the Berlin based Homophon Company GmbH which issued the Homokord and Homocord labels in Germany. If anybody has additional information about Gertrude Meller, I would be interested in knowing about it. 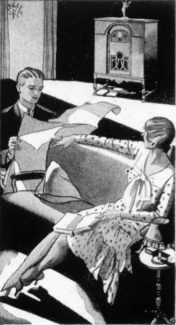 This entry was posted in 1920s, British Recordings, Classical, Salon Music. Bookmark the permalink.